Singapore, 12 May 2015 – The finals of the TrackChef 2015 culinary competition, organised by race promoter Singapore GP, was held at At-Sunrice GlobalChef Academy yesterday. Launched on 4 March, this inaugural culinary initiative saw 24 chefs from six five-star hotels and 12 budding pastry chef apprentices from At-Sunrice GlobalChef Academy come together to design a brand new hospitality menu for the 2015 FORMULA 1 SINGAPORE AIRLINES SINGAPORE GRAND PRIX. "We’ve had an exciting two months witnessing some of Singapore’s best chefs and promising student chef apprentices collaborate to produce amazing and innovative dishes for the hospitality suite menu. From tea-infused desserts such as Yuzu ‘Clipper Ever-green Tea’ Mousseline to a local twist on international dishes such as Braised Boneless Beef Ribs with Satay Spice and the Hainanese Chicken Taco with Avocado, Sour Cream and Coriander, the competition has truly pushed the benchmark on our culinary offerings. 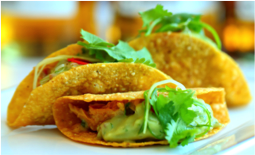 We look forward to presenting a brand new gastronomic experience at the 2015 FORMULA 1 SINGAPORE AIRLINES SINGAPORE GRAND PRIX,” said Sunil Shamdasani, Director of Operations, Food & Beverage of Singapore GP Pte Ltd. In an industry first, the industry chefs were teamed with and mentored 12 pastry chef apprentices from At-Sunrice GlobalChef Academy to produce desserts for the menu as part of this culinary competition. This exclusive opportunity provided a platform for promising student chef apprentices to showcase their talent and gain industry experience by some of the best chefs in Singapore. Participating hotels were divided into three teams (Team 1: Grand Hyatt Singapore and Sheraton Towers Singapore, Team 2: Intercontinental Singapore and Marina Mandarin Singapore, Team 3: Pan Pacific Singapore and Mandarin Oriental Singapore). Each team comprised eight chefs, and four budding At-Sunrice GlobalChef Academy pastry chefs. 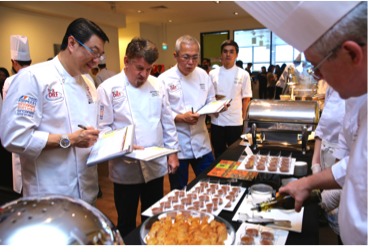 Participants presented their proposed menu to the judging panel, which includes Singapore GP representatives, as well as award-winning chefs Otto Weibel, Eric Teo and Martin Woo.